Marshall is sick of the apocalypse happening on a weekly (if not daily) basis. Life is constantly in peril, continually disrupted, but nothing significant ever happens. The emergency is always handled. Always. Marshall wants out; he wants it all to stop…one way or another. Even if he has to end the world himself. 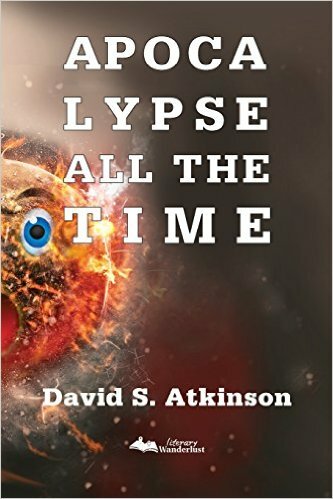 David S. Atkinson has devoted his free time to reading and writing for as long as he can remember. 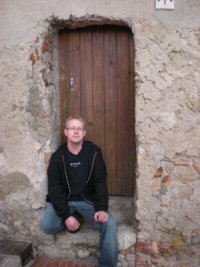 His writing focus is primarily fiction—short stories and novels—though he expresses himself through poetry and nonfiction as well. David also has a fondness for obtaining college degrees, with four at the latest count (B.S. in computer science from the University of Nebraska Omaha, J.D. from Creighton University, B.A. in English literature from the New York Institute of Technology and M.F.A. in creative writing from the University of Nebraska). Originally from Nebraska, David now spends his nonliterary time working as a patent attorney in Denver, Colorado. David can also be found on Twitter (@DavidSAtkinson) and Facebook (www.facebook.com/wightknyte). I was born in Omaha (within fifteen or twenty miles of what was Strategic Air Command at the time, a first tier target and thus instantaneously glass in any Soviet nuclear apocalypse scenario, feeding into the idea in Apocalypse All the Time of living amidst apocalypses), spending most of my life up until 2008 there other than a year in Bellingham, Washington; two separate years in Seattle; and six months in Loveland when I was two. I moved to Denver eight years ago for work and love it. I work as a patent attorney, concentrating on computer and electrical related inventions. Reading and writing seem like a break compared to what I do for work, so it’s always fun. Apocalypse All the Time is a product of being inundated with apocalypse predictions. People were obsessed with nuclear war during the Reagan years and talked about it endlessly. That’s probably good since it probably helped it not happen, but it seemed constant and yet highly unlikely absent some total accident. Endless predictions about the millennium, the Rapture, the Mayans, Heaven’s Gate, Y2K, it never ended. It seemed so absurd that I started thinking about a world where that sort of thing was happening at the rate it seemed to be predicted, but somehow still have all that be tiresome to the people living there. I suppose it was a bit of an externalization of how I felt about all the predictions. Things grew from there. Each character seems to come about in different ways. Marshall and Bonnie in Apocalypse All the Time started out as their roles, what function I needed them to perform. Then I placed that shell in the action and saw how they behaved there, essentially letting them define themselves as we went along. They kind of “became” as the book progressed. Looking back, I don’t think I could have gotten them right any other way. Of course, I’ll probably do something totally different for my next characters. I try to listen to what feels right in each case. Inspiration can come from almost anywhere for me. Other books, TV, movies, other people’s lives, my own life, a McRib, there’s just no telling where it can all come from. I just try to pay attention when it zaps into my brain. Harnessing it is the real trick. As for what got me started, it all comes down to an early love of reading my parents instilled in me. Frog and Toad, what have you. I couldn’t stop reading and it seemed natural as part of a love affair with reading to try to write stuff of my own. I write wherever I can. On the bus, during rare slow moments at work, in bed, in my study, at the kitchen island, in the car (when someone else is driving), in hotel rooms, wherever. Working as an attorney full time, I need to write when I can. This goes particularly for Apocalypse All the Time, which was originally drafted during Nanowrimo. Given 50,000 words in a month, you’ve got to write everywhere. As for ritual items, all I pretty much need is a pen and paper or computer (I usually write longhand first and then type it up later, but not absolutely always). I love music, but it creeps into what I’m writing and doesn’t usually jibe well. Drinks are useful if I’m thirsty, but not necessary otherwise. Of course, I drink somewhere around 5-10 cups of coffee a day so there’s a good chance I may have some coffee while writing, just by coincidence. I try to avoid ruts in reading, so I try to wander around as much as I can. I typically read about 200-300 books a year, so that leaves some room for wandering. I’m fond of absurd literary stuff like Etgar Keret, Amelia Gray, and Haruki Murakami, but I also like more straightforward material like Joyce Carol Oates, Dostoyevsky, Flannery O’Connor, and Balzac. I’ll sometimes get into Stephen King and Clive Barker, and other times get into William Gaddis and David Foster Wallace. Amber Sparks, Gabino Iglesias, Ben Tanzer, Michael Seidlinger, Colette, I’m all over the place. I’ll give a lot a chance and love roaming words. I think the most important advice is to keep writing. Everything (self-doubt, doubts from others, publications, lack of publications, writer feuds, sales woes, readership, readership woes, and so on, and so on, and so on) will either work out or not (likely work out at least as much as it/they needs to), if you keep writing long enough. If you stop writing, then there’s nothing there when other problems clear up. There’s a lot of other good advice out there, mountains of it, but if you’re not writing I don’t see how it can do you any good. When George W. Bush was elected the first time, I sent his transition team an application for the position of Secretary of Defense. I actually received a postcard acknowledging receipt by the team. That was the last I ever heard, though I still keep that postcard to this day. America is probably lucky no one took me seriously though. We’d have worse apocalypses than go on in my book. Thanks for talking to me! So much fun.